Spring has finally sprung here in our part of Virginia! The grass is growing, the birds are chirping, and its WARM! The weather here can be all over the place. Usually it feels like we skip right over the spring temps and go right into summer temps. Since we moved in January we need to tidy up the yard and flower beds. Its hard moving in the middle of winter. We don't know what kind of trees, shrubs, or what may pop up in the yard. So it has been interesting to see what is here. We have a few flower beds that I know need to be cleaned out and replanted. And of course, I need to figure out where my herb garden is going to go. We have more wildlife here so I'm not sure if I will go full in on a garden this year. May just plant a few things in pots on our deck. 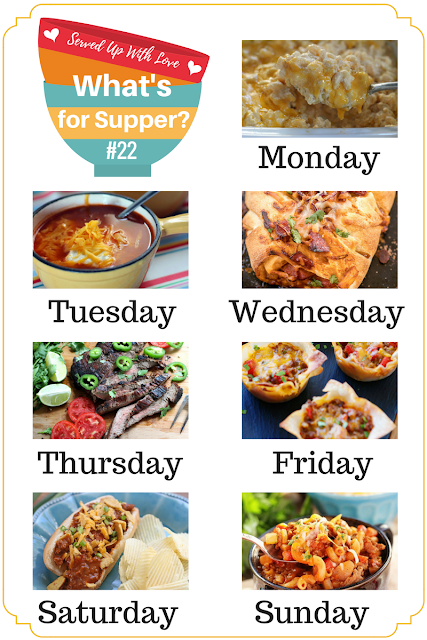 This weeks meal plan is simple and easy. We have a few appointments during the week so my slow cooker will give me a big hand in the kitchen. As always, if you are following along, just click any of the recipe titles and it will take you right to the recipe. If you want even more inspiration, check out last weeks What's for Supper Sunday.